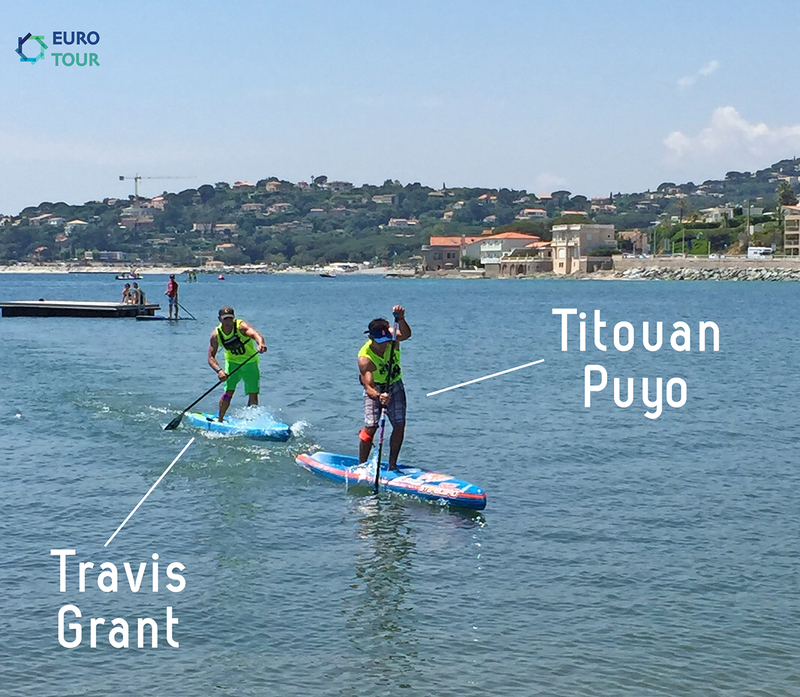 Travis Grant and Sonni Honscheid have triumphed at the SUP Race Cup in St. Maxime, France, after an all star field lit up Week 2 of the Euro Tour. Travis took control of the event by dominating Saturday’s course race, before holding on for a close second place behind Titouan Puyo in Sunday’s 17km event. That handed Trav the overall event title based on combined times, and also delivered a full bag of points for the Euro Tour Leaderboard. Sonni was pushed by her SIC team mate Lina Augaitis, while France’s Celine Guesdon, a medalist at the Worlds earlier this month, was solid in picking up a pair of thirds. Travis now sits comfortably on top of the rankings after two event wins in as many weekends, while Sonni Honscheid is dominating the women’s leaderboard following her second trophy in eight days. But while Sonni can continue her streak this weekend at the big Lost Mills race, Travis won’t be able to climb any higher: The NSP team rider returns to Hawaii this morning in search of outrigger glory, leaving the likes of Titouan Puyo, Connor Baxter, Jake Jensen and Leo Nika to battle for the men’s Euro Tour championship title. 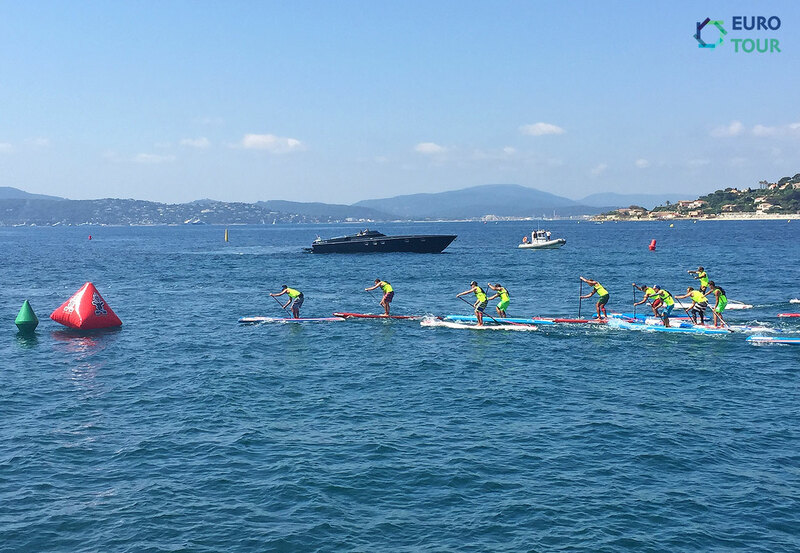 The SUP Race Cup, the longest-running international race in Europe, saw a solid lineup of paddlers in its 6th annual edition. 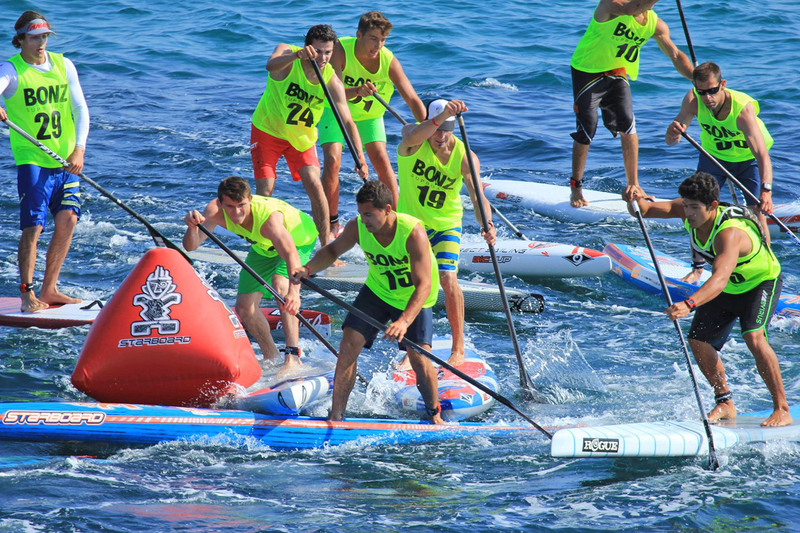 The weekend began with Saturday’s “Beach Race” (Battle of the Paddle style course race, but without the waves), where Travis and Sonni proved the quickest round the buoys to draw first blood. It was a close contest, highlighted by a manic start in which 100 odd competitors sprinted from knee deep water out to the first buoy. The field soon spread thin, and after half an hour of paddling it came down to Travis Grant, Jake Jensen, Titouan Puyo, Arthur Arutkin and Leonard Nika. Jake and Trav broke free to sprint to the line, with the world number four getting one up on his junior compatriot (who sits just one spot behind him on the world rankings). Titou outlasted Arthur, who in turn beat Leo in the final sprint to the line. Behind the top five it was France’s long-time international warrior, Eric Terrien, edging past Mexico’s Bicho Jimenez, with Frenchies Gaetan Sene, Joseph Gueguen and Vincent Verhoeven filling a solid top 10. Here’s a cool little clip of the top packs rounding the buoy mid-race. In the women’s course race, Sonni crossed the line just 13 seconds ahead of Lina, with Celine a further minute behind. There was a two minute gap outside the podium, with local girl Olivia Piana outlasting international athlete Shelby Taylor. So that was the course race, with Trav and Sonni taking a handy lead into Sunday’s decider, the 17km long distance event. The marathon race again saw a very tight start, with several long trains bunched together in the opening stanzas. Once again the favourites led early, with Titou setting the early pace as Jake, Travis, Leo and Arthur fell into rhythm. By the mid-point of the race it was a five-way battle for the men’s trophy. Titouan and Travis seemed in control, however Jake, Arthur and Leo were not letting go. Bicho fought valiantly to reconnect his wagon after getting dropped, but eventually he faded. Around the 12km mark the leaders hit a mini-downwind section, which opened a window for Titou and Travis to make an escape. They milked the small Mediterranean bumps for all they were worth, and eventually opened a solid gap on their three rivals that would remain until the end. By the time they reached the final, 2km flat stretch to the finish, the pair were over a minute ahead and locked in a duel for the crown. As they entered the shallow waters, Titou sat in front and didn’t give Travis any room to pass, eventually jumping on to the sand and running up the beach for a well deserved victory. 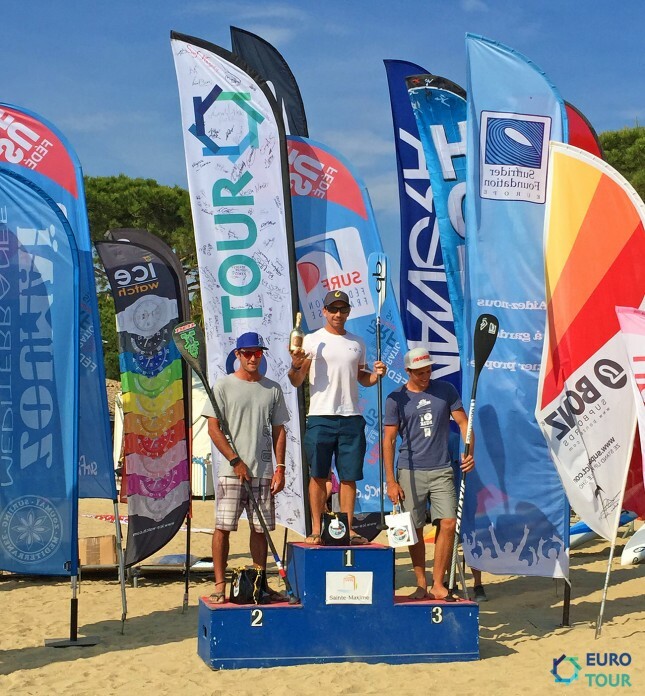 But by finishing within just a few seconds, Trav did more than enough to hold onto his lead and claim the overall SUP Race Cup title (and a big cache of Euro Tour Leaderboard points as well). Leonard Nika continued his impressive European campaign, outlasting Jake in the sprint to the line. The pair hit the beach two full minutes after Trav and Titou, which highlighted the amazing pace the leaders were setting. Arthur Arutkin dropped off the back of Jake and Leo in the final kms, finishing in no man’s land to secure a top five overall result. Bicho came home in 6th place, while an impressive Giordano Gaparella, a virtual unknown on the international scene, upset his more fancied rivals to claim 7th. Gaetan Sene wrapped up the weekend with a pair of 8s, while rising stars Martin Letourneur of France and Davide Codotto from Italy rounded out the Top 10. France’s formerly-undisputed #1, Eric Terrien, stopped paddling mid way through the distance event and took a “DNF” on the results sheet. For many years ET carried the hopes of France (and Europe) on his shoulders at the international races, but now it seems the younger generation is starting to pass him by. Though he wasn’t the only one feeling the metaphorical (and literal) heat in St. Maxime on Sunday: Joseph Gueguen, a top 10 finisher in Saturday’s course race, also hit the wall and retired halfway through the marathon. Mat from Total SUP has an interesting breakdown of the performances from each of the top finishers. Meanwhile over in the women’s race, the field was significantly smaller than the men’s but the level of competition at the pointy end was just as high. World number five Sonni Honscheid made it a clean sweep of the weekend by outlasting Lina in a two hour marathon. That gives Sonni an unbeaten start to the Euro Tour summer of SUP. Celine Guesdon was once again third, not too far off the pace of Lina to show that her intense off season training has paid dividends. Riviera’s Shelby Taylor finished one place higher than Saturday, taking 4th in a more-than-respectable time of 2 hours 9 minutes. All four of these strong women will hit the road to Germany today or tomorrow, where they’ll face off once again (along with the likes of Fiona Wylde and Angie Jackson) at the huge Lost Mills showdown. Until then, it’s time to enjoy some baguettes, wine and a book of cliches.